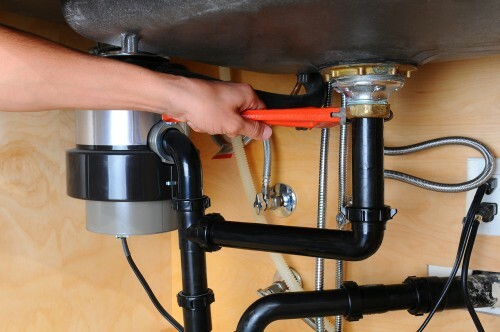 Fix Your Broken Garbage Disposal Today! Call the Most Experienced Plumbers in Irvine, CA, for First-Class Plumbing Service 24/7. At Irvine Plumbing and Rooter, we are certified to repair and install all major brands of garbage disposals. When your household garbage disposal is on the brink of failure, pick up the phone and give us a call. We’ll put you in touch with a local contractor who has the ability to get your disposal up and running in time for dinner. Garbage disposals have been around since the 1940s. While more households have these modern day appliances than not, there are still a few people that dispose of their food waste using trash receptacles. Food left to rot in trash cans not only smells, but it breeds bacteria. If you’re interested in installing a garbage disposal, we can help. Our contractors can help you choose a model that meets your disposal needs while staying within your budget. So, your garbage disposal has worked beautifully for you for the past seven years, but lately, it isn’t working as well. What should you do? Repair the unit or replace it? First, let us take a look. Most household garbage disposals can last up to 10 years. So, it’s possible that it is on its way to irreversible failure. But, the reason it’s not working could also be the result of a jammed propeller or wiring that has come loose. Just because your disposal stops working doesn’t always mean you’ll need to replace it. However, if replacement makes better economic sense than repairing the plumbing appliance, we’ll not only help you choose a new model, but we’ll install the new disposal for you too. You can extend the life of your garbage disposal by using it properly. These appliances are tough, but they do require a bit of tender, loving care, especially since they are used frequently throughout the day. One of the best ways to care for your garbage disposal is to only put food waste into the receptacle that is non-fibrous and won’t clog up the blades. When the blades’ movements are obstructed, this puts additional strain on the motor. Too much stress can lead to irreversible failure. For maintenance tips, shoot us an email, check us out on social media, or give us a call. As a comprehensive plumbing service in Irvine, California, we make ourselves available 24 hours a day, seven days a week to answer all your questions to ensure that your garbage disposal works at its peak performance around the clock. We even offer toilet repair and installation as well as other kitchen and bathroom plumbing services.